Criminal Minds: Jeffrey & Roberta Seymour - THE CORRUPTION OF THE BROWARD COUNTY JUDICIAL SYSTEM AND THE FIGHT OF KEVIN MILCHECK TO RIGHT THE INJUSTICE IN BROWARD COUNTY, FLORIDA! Florida Agencies with No Response! Roberta Seymour and her internet posts...about Kevin Milcheck & others! Chief Judge Peter M Weinstein...Will he rule in favor of Kevin Milcheck? A note to Jeffrey Seymour from Kevin MIlcheck! H...I guess caring is not allowed...Kevin...What a sad time we live in! When corruption runs rampant, someone has to stand up! I lived...I am still alive! ...and I am going to make a change! The corruption of Lake County grows and grows and it is not limited to one person, but many. I thought I would not experience another thing in my lifetime, but now I again have seen the corruption of this county! H...,(How could you lie?). I hope you do the right thing and help correct this corrupt county to include a Judge, Judge Miller and an Assistant State Attorney(Name to follow...I give you 3 days to do something! START 3/14/2016), also I believe a questionable...actually more than questionable... attorney Jamie Washo! A sorority of 3! Also, very important... the corrupt Lake County Police Officers, actually only one. I would bet...Right out of High School and onto the force! More names to follow! Plus the whole story! Here is an opportunity for you to correct a wrong! Now to the first story of the corruption of Lake County! The ability to sue Gold's Gym! 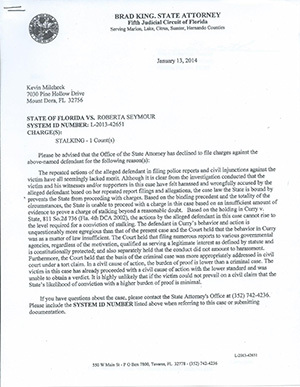 A Mount Dora police Officer did an investigation and found Roberta Seymour Guilty of filing false police reports, false affidavits and false injunctions over a period of 2 years and the Lake County State Attorney refused to prosecute on January 2013! 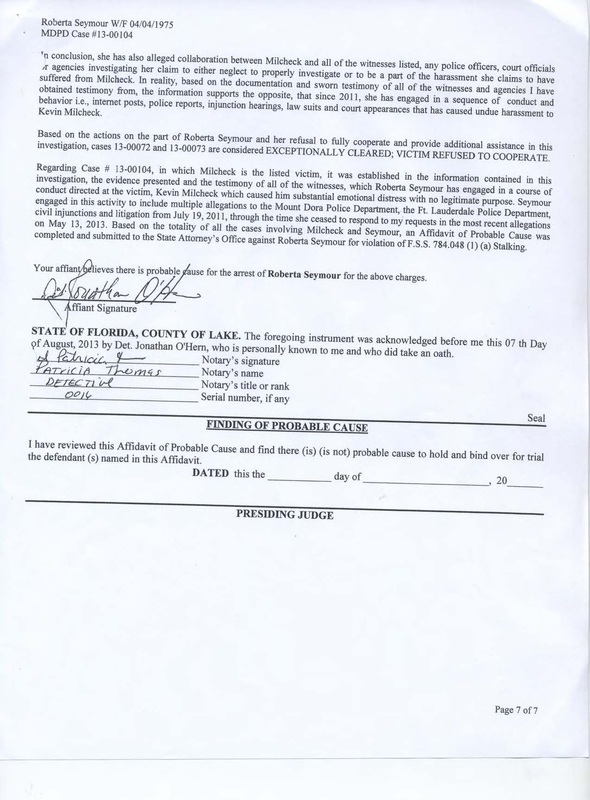 1) The false arrest of myself by the Lake County Police Department on Burglary charges. I was charged with burglary, for trying to get my ex girlfriend into an AA class. You see when I got over there she was next door at a 9 time drug felon's house, which I did not know. My ex girlfriend had been diagnosed with an enlarged liver a year before and was told by the Doctor she needed to stop drinking. I was arrested for burglary and never searched and my car was never searched. Burglary...Really? Now I get to see the false arrest charges all over the internet! There is only one police officer to blame for that. The tall drink of water that probably just managed to graduate from high school. The other police officer that spoke with me first...Very fair and honest. In my opinion, a good man! I will retain judgment until I hear his testimony...If it happens as it should. 2) My ex girlfriend started making false accusations that I had hit her. Why would she do that? Did she do that because my attorney Jamie Washo told the Assistant State Attorney information that was confidential and shared it with the prosecution? I know that is what happened? I shared information with my attorney that my girlfriend had hit me several times when she was drunk and left bruises on my body. No reason for my ex girlfriend to lie! I was not pressing charges! 3) The sorority relationship that exists between The Judge, the assistant state attorney and Jamie Washo is criminal. Far too many lunch dates between the 3 of them. They have lost all perspective on cases and people...I am sure mostly men...get screwed in that criminal courtroom. 4) Jamie Washo the defense attorney who does no defense. Never once told me anything, but to take a deal. I kept turning down a deal and finally she quit...well actually Judge Miller let her quit. I would assume that she let her quit because of the special relationship she has with Jamie Washo. Actually, she had it all planned out with the prosecution...Her and the prosecution were like a couple of school girls that day in court...pathetic! Very criminal! I spent money on Jamie Washo for no defense at all! ..I read from attorneys that if you file a false police report you could go to jail. Wow, is that a farce! If you are a woman you can file as many as you want, add some false affidavits in there and a few false injunctions for good measure! Oh, Roberta Seymour started with a false injunction in Lake County before filing the 3 in Broward County stated below. 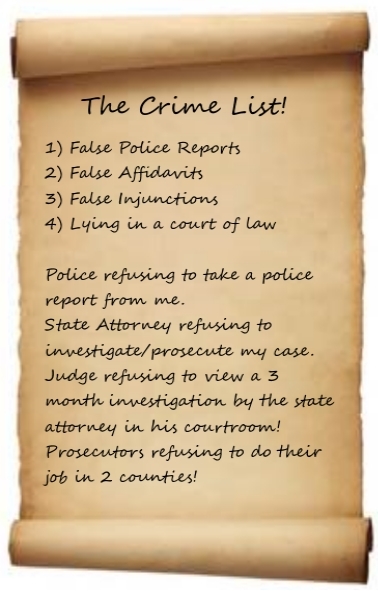 Don't forget to add a few false police reports and affidavits to that also in Lake County! 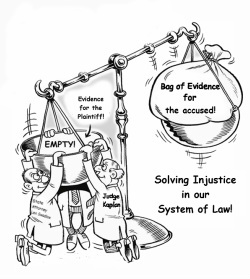 How corrupt is our system of law? This has not only affected me, but my family as well! Just in case you want to read...Det. O'Hern of the Mount Dora Police Department (Lake County where I live) conducted an investigation after the corruption in Lake County and Broward County finding Roberta Seymour guilty of lying on every police report, affidavit and injunction in Lake County and Broward County!...Lake County and Broward County let it go on and on and on and on! Why was Roberta Seymour not prosecuted? Lake County protecting Broward County? Lake County State Attorney protecting Broward State Attorney? I'm not a rocket scientist, just was a lowly electrical engineer, but I can figure this one out! So a woman, who is trying to falsely sue Gold's Gym makes up 2 years of lies, has me in the courtroom for 2 years on 100% lies and nobody does a thing, because they are trying to protect one another? Why are counties allowed to get away with criminal behavior? Isn't it illegal to lie on an affidavit? Assistant State Attorney Len Swadlow of Broward County knew they were lies! Why did Broward try to prosecute and convict an innocent man? After the criminal acts occurred in Broward County, Detective O'Hern of Lake County proved they were lies! View his investigation below on the right! Why didn't Broward County do this? Here are false affidavits she made to the State Attorney on the right. 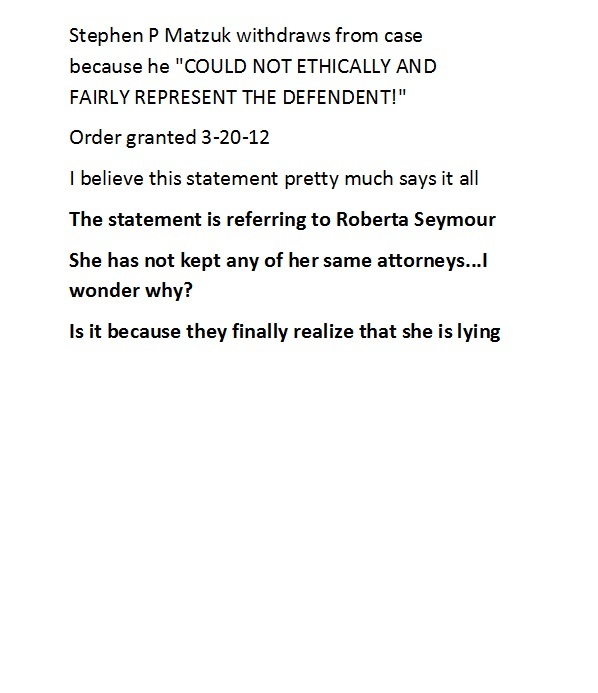 Still Roberta Seymour has not been prosecuted! All proven to be lies! Remember, when in Broward County, it is alright to lie and lie she did for 2 years in one county! Down below on the right you can read her false injunctions. Soon, I will post her false police reports! It amazes me the corruption in our system of law! It amazes me the corruption in Broward County. Oops...I live in Lake County 240 miles away? Let me remind everyone that approximately 2 million false injunctions are filed every year. Should someone have to endure a multitude of false injunctions and false affidavits and false police reports and false State Attorney investigations? Not just one...and in 2 counties? I have received no action from every single different law enforcement agency in the state of Florida. I am writing this because I seek Justice. I am writing this because of the massive corruption that has occurred in Lake County and Broward County, Florida. I have contacted the Mount Dora Police Department, Lake County State Attorney, filed injunctions in Lake County where they refused to do a thing, tried to sue Roberta Seymour in Lake County. No action by the Fort Lauderdale Police Department, Internal Affairs of the Fort Lauderdale Police Department plus numerous other divisions in the police department. I have contacted the State Attorney and Assistant State Attorney Len Swadlow of Broward County, Chief Judge Peter Weinstein of Broward County, the Judicial Qualifications Commission, the State Attorney General Pam Bondi, the FBI in Miami and also Daytona plus many others. The Attorney General Pam Bondi said I have some serious charges, but nothing is done. No one wants the truth to come out. Why?...Because it will show probable criminal action? Probable criminal action on Lake County and also Assistant State Attorney Len Swadlow, Probable criminal action on Judge Michael G Kaplan and probable criminal action on the Fort Lauderdale Police Department to include Sgt. Hector Martinez. Everyone already knows definite criminal action by Roberta Seymour and her husband Jeffrey Seymour. What have I learned: A man cannot file one single injunction on 100% the truth, nor can he file a police report without incredible difficulty or even begin to get a State Attorney investigation started on 100% the truth! I have found that a woman can file multiple injunctions on 100% lies, plus file so many police reports in two counties it would make your head spin, plus start a State Attorney investigation on zero evidence and 100% lies. Pathetic...Did I tell you that we both live 240 miles away in Lake County? Click on the emails sent between myself and Assistant State Attorney Len Swadlow on the right. Then ask yourself, "Why Roberta Seymour was able to file multiple police reports, a State Attorney Investigation, and 3 injunctions in Broward County on 100% lies, when I could barely get a police report filed on 100% the truth?" Finally, I was allowed to file a police report. Did they do anything? Of course not. The truth finally was proven by detective O'Hern of Mount Dora, Lake County Florida, see below on the right, after the corruption in Broward County! I still have faith that Roberta Seymour and Jeffrey Lee Seymour(Arrested twice already that I know of...criminal contempt in Lake County, Fl., Preventing or Obstructing Extinguishment of Fire in Palm Beach County, Fl.) will go to jail, for 4 false injunctions, false police reports, false affidavits to State Attorneys and the numerous false internet postings and lying in a court of law. Lake County will be investigated and the State Attorney sued for their obvious corruption in this case. Judge Michael G Kaplan will lose his job and there will be an investigation on Judge Michael G Kaplan and his involvement into Roberta Seymour's crimes along with the Assistant State Attorney Len Swadlow and Sgt. Hector Martinez for their complete refusal to continue the investigation, for their refusal to continue working with Detective O'Hern of the Mount Dora Police Department and their complete refusal to help me in any way in their crooked county, concerning Judge Michael G Kaplan who has to be the most corrupt Judge in the HISTORY OF MANKIND! I would also like to see a review of the Judicial Qualifications Committee. A Florida group set up to review possible corruption in the Florida Judiciary. They ruled to do nothing...A simple committee of Judges protecting Judges. 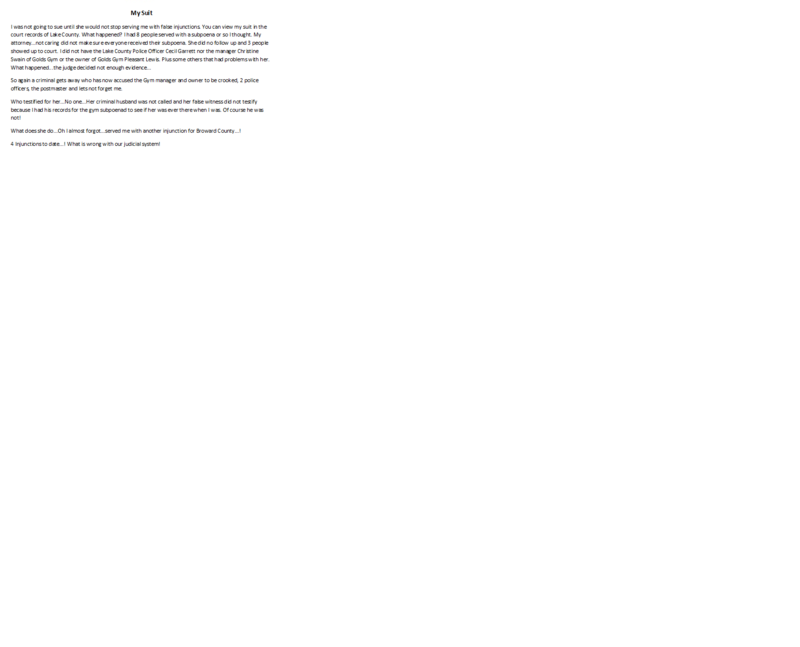 Click on my State Attorney conclusion on left. WHY...No Prosecution for Roberta Seymour? Of course number 1 is most important! I know our system is full of corruption. A site trying to change the laws so injustices such as this do not occur! 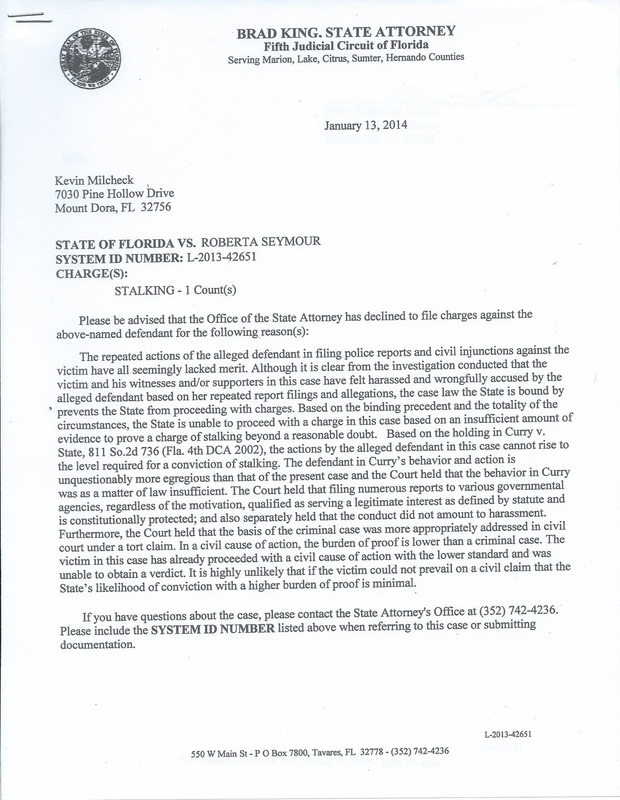 Did Lake County refuse to prosecute Roberta Seymour because of the criminality of Broward County? Were they trying to protect the criminal actions of a criminal county? Of course the State Attorney of Lake County was! Do the Seymour's know someone in the Fort Lauderdale Police Department... The Broward County State Attorney's Office...or the Judiciary of Broward County? Why was Roberta Seymour allowed to file so many false allegations with the police, the State Attorney and 3 false injunctions in Broward County alone? Let's not forget in a different county that neither of us even live! Why did Sgt. Martinez and Assistant State Attorney Len Swadlow stop working with Detective Ohern of the Mount Dora Police Dept.? Why didn't Assistant State Attorney Len Swadlow demand an investigation after he found Roberta Seymour's allegations to be false? Why wouldn't Sgt. Hector Martinez of the Fort Lauderdale Police Department do any investigation on my behalf? I was told "there are murderers out there"...Well you did intensive investigations for Mrs. Seymour! Why did the Fort Lauderdale Police Department not allow me to file a police report on 100% the truth for many months and then refuse to do anything about Roberta Seymour's false allegations when one was finally filed? Why did it take the help of a retiring police officer for me to get a police report filed in the first place? After I filed a police report, which I was told to do by Assistant State Attorney Len Swadlow, and which he did everything not to help me file...Why did Assistant State Attorney Len Swadlow refuse to do anything? Want to see my 100 email messages with him? How am I in court in a county that neither of us own a thing, with 3 separate false injunctions signed by Judge Michael G Kaplan? Why on the first trial with Judge Michael G Kaplan, did it take 3 appearances to get the case dismissed on the bases of jurisdiction? How does Judge Michael G Kaplan demand a trial after the Assistant State Attorney finds zero evidence in a county that neither of us live in? How can I get an injunction from Judge Michael G Kaplan on zero evidence?...Actually, I had all the evidence supporting her lying! Why won't they correct their mistakes?...Maybe refer back to question 1! ﻿Do you think Roberta Seymour is Nice? Not enough courage to write her name on her reviews! Just a small sampling of possible witnesses! You can view page 7 from the police report I was finally able to get accomplished after all the Broward County Injustice a few paragraphs down in the article. You can read the entire Police Report in pdf format on the right under Lake County Police Report. Mrs. Seymour's lies affected not just myself, a stroke survivor, but others important in my life. My father, my mother, my girlfriend and many people in Gold's Gym. Please read my story below. This story starts slow and builds to 4 false injunctions, numerous affidavits, numerous court appearances in one corrupt county! A quick overview of what happened...It started in Gold's Gym of Mount Dora Lake County, Fl. in Nov. of 2010 shortly after a friend of mine told Mrs. Seymour I had money! I was accused of harassing her. I was speaking with an acquaintance at the time, Officer Clay Parker. After the accusation, I tried to speak with Mrs. Seymour and let her know that I did no such thing. Officer Parker tried to speak with her and tell her that I did no such thing. Mrs. Seymour would not listen to either of us. I never knew she existed up until that point! Over the next 6 months I noticed her watching me...some minor expressions were sent my way. June 2011 she accused me of telling her to "f*** off". This time officer Cecil Garrett was watching me in the gym. Apparently, she lied and told him I was harassing her. I told her I did no such thing and Officer Garrett confirmed this. Then complaints to the management started. When that did nothing for her, the complaints to the police department started. I gave a statement to the police. After my statement to the police, Officer Patricia Thomas warned me and my family to be careful of Mrs. Seymour. Officer Thomas felt Mrs. Seymour posed a risk to my family! Having no luck with any of her complaints, Mrs. Seymour filed an injunction against me, injunction 1 on the right. Shortly after this, Gold's Gym discontinued her membership. This injunction was promptly thrown out in court. 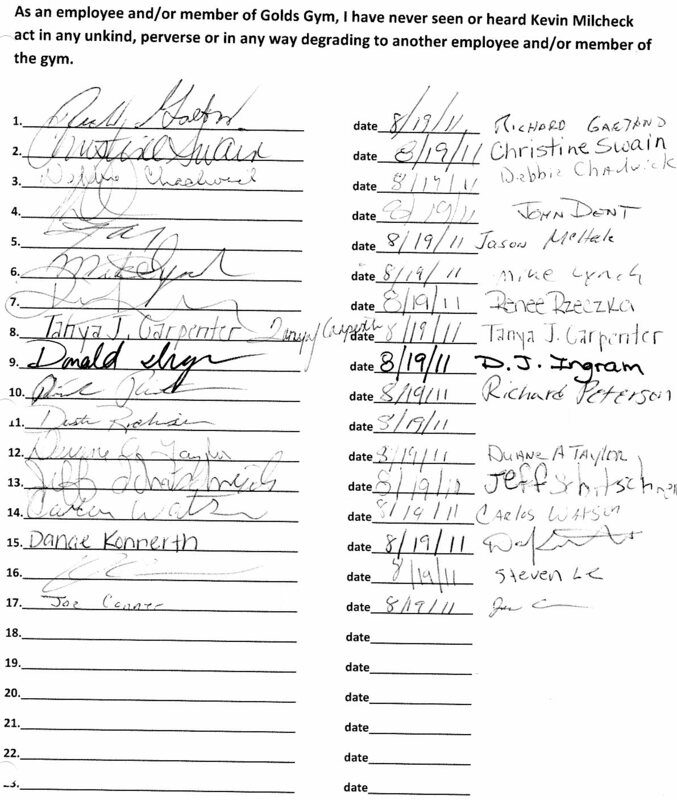 If you want to read some statements from members from the gym, they are on the left. I filed a small claims lawsuit against Mrs. Seymour. In the lawsuit I had a paper that she wrote to Gold's Gym. I saw it on the desk of the manager and asked if I could have it for my lawsuit. They forgot to white out her contact information. In it, she stated some very negative things about me. After reading my lawsuit, Mrs. Seymour believes she can sue Gold's Gym. How does one do that? Start accusing me of phone calls, internet postings...cyber stalking, because she knew I had her phone number and email address and Gold's Gym gave it to me. Read injunction 2 on the right. This injunction was filed in Broward County, Fl...4 hours away from where we both live. Neither of us own a thing in Broward County! This is where the real trouble started. Roberta Seymour lied on police reports, injunctions, affidavits, interviews with the State Attorney for 1 goal, which was money. Having no luck in Lake County, Fl where we both lived, she made these claims in Broward County...4 hours away! The police listened, the state attorney listened and the judge listened(Judge Michael G Kaplan). She was able to file 3 injunctions, false police reports, false affidavits, get an investigation by the State Attorney over 1 1/2 years until I was issued an injunction. I might add...she received an injunction on zero evidence...zero! I tried to get the police department of Fort Lauderdale to help, I tried to get the Asst. State Atty. Len Swadlow to help (100 emails back and forth) they offered zero help. I was finally able to file a police report in Broward County after months of trying...Nothing was done! I will file a list of everything that occurred in Broward County, Fl. It is going to take me a while to get everything together. There is so much information! Why was Mrs. Seymour able to file all these lies, with these different departments and I was only able to file 1 police report on 100% the truth? It was not until after I received an injunction in Broward County, Detective OHern from the county where I live, decided to right a wrong...He should be commended! Read page 7 of the Police Report down below. Officer OHern told me during his investigation the Fort Lauderdale Police stopped working with him...WHY? If you want to read the full report it is posted at the top on the right. This by no means rectifies what I have been through in Broward County! This report does not erase my injunction. What it has accomplished is keeping the Seymour's from taking me back to court in Broward County. There is 100 percent corruption that surrounds that whole county from the police right up to the judges! This is why I ask everyone to sign my petition on the upper left. This should never happen to anyone! How can someone completely lie on Police Reports, Affidavits, numerous interviews with the Asst. State Atty., 4 Injunctions, and not be prosecuted for it. Plus, in a county that neither of us live! I had to travel 8 hours from Lake County and back 12 separate times at least, over a period of 2 years! Welcome to the world of Florida's Executive and Judicial Branches. I am speaking of Broward County, Fl for the most part! I will get to them in a second, but first I want to thank Detective O'Hern. No one in the Mount Dora Police Department would investigate my case up until his arrival....In Broward County, they were unwilling to do anything for me! I believe God put him there!.....He worked there for a short time only and moved on. Detective O'Hern of Mount Dora, Lake County Fl, investigated my case and found the truth. This is the county where both myself and Mrs Seymour and Mr Seymour actually live. If it were not for him, Broward County and the Seymour's would still be giving me injunctions! Maybe jail and the Seymour's would be suing Gold's Gym right now. Why did the Fort Lauderdale Police stop working with Det. O'Hern? Why wouldn't Broward investigate and help to prosecute these criminals? In my mind there can be 2 reasons.....Corruption! and Sexual Bias!.....I believe massive corruption! Everyone should be concerned with the injustice that occurs in Broward County, FL and across our entire country. Everyone please sign my petition by pressing the cartoon, upper left. Stalking....cyberstalking...phone calls...Read the injunctions! It is truly unbelievable! Read down around the middle of the article below and see where Mrs. Seymour accuses me, along with officer Cecil Garrett and the Mount Dora Postmaster of holding up her father's hair care package...REALLY?...REALLY?...REALLY? Oh and this was given to Broward County and they took her seriously...A county that neither of us live in!...REALLY? No one as of yet in either Broward County or Lake County has decided to prosecute Mrs Seymour or Mr Seymour. Why? Can someone please let me know Why? How about the Broward County Judge Michael Kaplan?, Asst. State Atty. Len Swadlow? Sgt. Martinez? My story is a little different. Yes there was bias, but I believe there is corruption in Broward County? Look at the injunctions on the right. Every word in every injunction proven to be a lie, but I was given an injunction with zero evidence...zero. How long was I in court you ask? 16 months...REALLY!... in Judge Kaplan's crooked courtroom! 16 months with zero evidence. Oh...and I almost forgot...THAT IS JUST IN BROWARD COUNTY...NOT LAKE COUNTY....Read Injunction 1 for Lake County! Just to let you know, I was not given an injunction in Lake County where we both live. In fact, Mrs. Seymour is under investigation! Read the Police Report and read the State Atty. button on the right proving my innocence, but still I have an injunction on my record? Why did I even get one in the first place? Why was there even a State Attorney investigation in Broward County?... Why did he choose not to help me in court? Why did he not prosecute Mrs Seymour for the lies she told in his office and the courtroom? Of course he did find me innocent...completely after a 3 month investigation? What good did that do?...He chose not to help me over the next 18 months. I have 100 emails back and forth...I was thinking of posting them. Remember... we both live in Lake County! Why am I being investigated by Broward County Anyway? It is impossible to think that people in charge of our laws are this inept, corrupt, or maybe a mixture of both? But do not get confused...The State Attorney of Broward County did everything in his power to...NOT!...do anything for me...Why? Read ON! As of yet nothing has been done. The Seymour's have not been arrested...but "hey", lying in a Broward County courtroom is alright if it is going to make someone some money! Broward County has not had to answer for their corruption! Oops!...I forgot in Broward County if your case has the potential to make them money be it kickbacks...Hey then let's get this guy! I have a hundred emails with Mr. Swadlow telling me I needed to get a police report filed so he could pursue Mrs. Seymour in Broward County. Well it took me months and many calls because they would not take a police report from me. Lets not forget that Mrs. Seymour was able to get 4 false injunctions, numerous affidavits, recorded testimony, a 3 month investigation by their crooked DA, 8 or so court hearings and an injunction. What was I able to get...after months of trying?...A police report that Mr. Swadlow would do nothing about. He said the police had to investigate. Sgt. Martinez of the Fort Lauderdale police would not investigate. Why? Why wouldn't Mr. Swadlow request it? My theory...Mrs Seymour knew someone down there and being that she concocted this story for money...well...I think you can figure it out because I have! Who was involved?... Mr and Mrs Seymour of course...The Judge? The Asst. DA? Sgt. Martinez? I was told Sgt Martinez stopped cooperating with Det. Ohern in Lake County...WHY? Len Swadlow never helped me...WHY? Judge Kaplan gave me an injunction with zero evidence...WHY? Oh and after 8 times in his crooked courtroom! Could it be that the Seymour's and possibly someone down there saw a payday with suing Gold's Gym of Mount Dora? I would give that a 100% yes! My story continues below but please press the cartoon, upper left. Sign your name and stop the injustice that happens to many innocent people across the country! If you read everything you will want to stop the injustice that this Judge's and other's arrogance, bias and unlawful rulings have caused. Please do more than read...signing the petition will only take a couple minutes. Thank You from all who have been wronged by this judge and judges across the entire country. Just to let everyone know I went through 16 months of court cases in Broward County. Judge Kaplan ordered an injunction against me with zero evidence...zero after 16 months in his courtroom. The Lake County Judge and...The Lake County State Attorney all are in collusion against Roberta Seymour. I guess I have ins with the postmaster also! This was given to Assistant State Attorney Len Swadlow and he still refused to do anything to help me!...WHY? Read how ridiculous...unbelievable! Read the first injunction which does not include all the people she blamed and ridiculed in Gold's Gym...How about the older lady who was on oxygen...She was afraid to go in and get her oxygen until Ms. Seymour left the dressing room! Unbelievable case of arrogance and uncaring! How about the gym employees she ridiculed. Read it...It is contained in the injunction she wrote and the Articles posted on the right of the website. Read the two injunctions from Broward County I posted...It gets worse...Unbelievable! Not to mention the real trouble that started in Fort Lauderdale, Broward County Fl that lasted 16 months and is still not over...Then ask yourself why am I in court in Broward County when both of us are residents of Lake County? Hmmm? Neither of us own a thing in Broward County! 4 false injunctions(Please read three on the right. The fourth is the same as the 3rd so I did not post it. I wonder how someone can make up so many lies and after 2 years not have the justice system pursuing them in both counties)...Soon Lake County will speak ...The 3 month long police investigation has been filed...I still have 1 crooked judge in Broward County...a police department and a state attorney's office trying desperately to protect not only themselves but a crooked judge in Broward County! The state attorney did a 3 month investigation and found zero evidence in Broward County. Please read his findings on the right. I sat in his office and he told me she was crazy! Why then did he not pursue her? Why then did he let a crooked judge give me an injunction? Why when he could have put a stop to it 14 months ago? Why!!!? Please read my story! How many lives has Judge Michael G Kaplan ruined in his tenure? I hope every one of you has an opportunity to get your case reviewed! After you have finished reading, please press the cartoon, upper left and sign my petition. This will take you to a website to fill out your name in support of the State Attorney General, along with many others reviewing Judge Kaplan's record and the procedures that the judicial and executive branches must follow across the country. Oh and just to let everyone know...Ms Seymour has filed an injunction against officer Cecil Garrett...filed numerous complaints against Officer Clay Parker and just recently tried to file injunctions with the State Attorney against Mike Lynch and Debbie Chadwick... Really... if what I heard was true about Mike Lynch and Debbie Chadwick where is the prosecutor on this case? All four of which were my witnesses that I could not afford to have them in Michael Kaplan's crooked courtroom! I forgot when you are a woman in Florida courts you can do no wrong! I am thinking of filing an official report to the Florida Judicial Qualifications Commission on a formal complaint against Judge Michael G Kaplan. The simple fact of the matter the corruption runs further than just this judge! Two people are looking at the case. Sergeant Hector Martinez (954) 828-5510 and Asst State Atty. Len Swadlow (954) 831-8479 . Will they do the right thing and press charges against Ms Seymour and her husband? Why wouldn't they?... Well the answer is NO! They refused a long time ago to do anything. Call them and find out why! 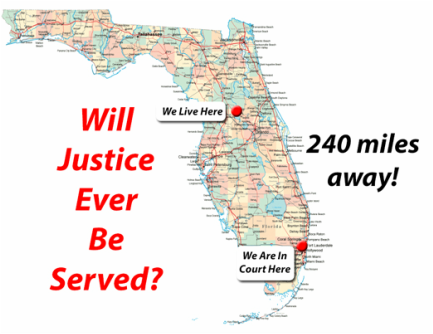 They are out of Fort Lauderdale... Broward County!...An Update to my injunction...I was told by Sergeant Hector Martinez there is no injunction against me anymore...Huh...16 months of hell...in and out of court...served an injunction by a crooked judge and now it has disappeared! Why wasn't I notified? I do not think this is true because I found it on the web. Another lie! I have had 3 injunctions served and signed by Judge Michael G Kaplan. The 3rd one I no longer had any money. It was in Broward county . I am from Lake County and so is Ms. Seymour. Two are to the right numbers 2 & 3. I did not post the fourth. The first is from Lake County. Yes...she also accused me in Lake County but the judge and state attorney in that county have some intelligence! So how does she get a judge in Broward being that she lives in Lake County? Lie and say you had to move! Plus, have a judge with questionable ethics! I am writing this in the hopes that the American public sees the injustice I have endured in the Florida courts for 16 months. Not too mention the 3 years I have had to put up with her lies...Dealing with her lies in the gym, talking to gym management, the police etc. Finally, after 16 months in court I had my final court date in front of Judge Kaplan. By the way...I had no more money, so I represented myself... So there I am in court and Jeffrey Seymour, "Her Husband" gets on the stand. Take note that this man has a criminal record...Arson, contempt of court, etc. The first thing out of his mouth was a lie. He said, I went after his wife in the courthouse located in Lake County which was a LIE!. I object and object again and object again...hell, I would have objected to everything out of his mouth because he lied. I have 4 witnesses from Lake County, two of which are police officers that can attest to this being a lie. Of course, they were not with me because I had no idea he was going to lie like this and further had no idea anything from Lake County was going to be brought up. Plus, I had no more money to have these people come down. Then he proceeds to tell the judge I called and emailed her...A LIE...Was any proof presented...NO!... The judge then allows him to state that I went after his wife at the Golds Gym from 19 months before. A lie that she started to try and get money out of me when she thought I was rich. Funny...she got thrown out of the gym from Golds because of all the trouble she caused but I am still a member! Read some of the letters on the left starting with Christine Swaine's the manager of Gold's Gym at the time! I forgot lying in Judge Kaplan's crooked courtroom is allowed so everything Mr Seymour stated is OK in the judge's eyes! Now it is Ms. Seymour's turn to lie. She tells the judge I went after her and stalked her in some dog park in Fort Lauderdale...funny, I did not even know where she claimed to be. Also, she stated in an affidavit to Asst State Attorney Len Swadlow that she was not sure who it was. Of course, she was not sure...SHE LIED! Is it not unlawful to lie in a court of law? I guess it is alright if you are in Judge Kaplan's courtroom! She also stated that I emailed and made phone calls to her...Surprise no evidence! Read just below for her claim she made to the Asst. 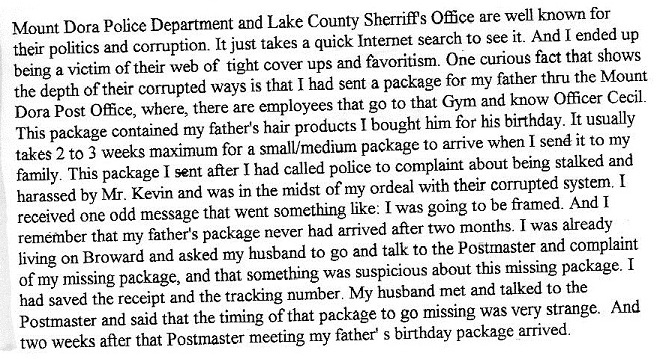 State Attorney Len Swadlow below...about the postmaster...REALLY! Lets not forget 4 total injunctions with 100 percent complete lies! I thought that was against the law! I guess not in Judge Kaplan's courtroom! I tried to interject that Len Swadlow did a 3 month investigation but Judge Kaplan ruled that his findings have no place in his courtroom...REALLY? I guess if you are not a fair judge...maybe he has some type of relationship with the plaintiff? Who knows, as I sit, I see 3 criminals...Mr Seymour, Ms Seymour and Judge Michael G Kaplan who is presiding over peoples lives and has no business doing so. Finally, her attorney brings in transcripts from our court date in Lake County where I stated I accidentally called her...By the way this was after 2 1/2 years of being harassed by her! a two second phone call that by the way was not even answered. Why did I do this you ask? Well, first can this happen? Yes... In fact it can, I was talking to Sergeant Hector Martinez, of the Fort Lauderdale Police Dept. He called me and did not leave a message. I called him back to see what he wanted and he said he accidentally called me instead of the Asst. State Atty. Len Swadlow. Now my story...Debbie Chadwick had told me of an acquaintance that can do computer sweeps on people and see who has been emailing her and such and where. If you did not read her injunctions you would not know that she has been accusing me of cyberstalking...emailing her...posting pornograghic images, etc. So, I wanted him to do a computer sweep on her computer. I just came home from another court case with Judge Kaplan where he ruled that this case would go to trial. Distraught and tired after a four hour drive home I pulled out Ms. Seymour's phone number and put it beside the individuals phone number I meant to call. What did I do... I accidentally called her number and realizied it after two rings and hung up! And this by the way is after I knew that the Fort Lauderdale Police told her to change her number and she told them that she was keeping the number because her attorney told her to do so. Hmmm...It does not take a rocket scientist to figure this out! Call Debbie Chadwich...I called her that night and told her what I did! Why did I even have her number? Read the WHY? button on the right. Any lawyers want to help? Email me... kmilcheck@hotmail.com, just hit the tab at the right. Read the few Articles she wrote on the right (A MUST READ). I ask myself everyday 'Why is this person not in jail? Why is her husband not in jail?" Roberta Seymour, Roberta Lola Seymour, Roberta Alice Seymour, Jeffrey Seymour, Jeff Seymour...Both are criminals. Help bring them to JUSTICE!